The Canadian Federation of University Women (CFUW - Sudbury), in partnership with the YWCA and the Women’s Legal, Education, and Action Fund (LEAF) present the 24th annual Celebrate Women on May 1st at Laurentian University’s Fraser Auditorium at 7:30 p.m. This year we look forward to hearing Elizabeth Hay speak about her book, All Things Consoled. Click here to download this year's poster in .pdf format. Celebrate Women includes the author's talk, a reception, book signing, and free parking - all for only $10. Funds raised support scholarships totaling $7000 for young women in Sudbury. In addition to attending Celebrate Women 2018, another way to support the work of CFUW Sudbury, YWCA Sudbury, and LEAF Sudbury is through a book sponsorship. For a $100 contribution, a copy of All Things Consoled will be placed in a secondary school, post-secondary, or public library of your choice, and your support is recognized with a dedication in the book. Individuals, groups, and businesses often choose to honour or remember friends, family, and colleagues in this way. Click here to download the book sponsorship form. ​#1 bestselling novelist Elizabeth Hay has written a poignant, complex, and hugely resonant memoir about the shift she experienced between being her parents' daughter to their guardian and caregiver. Jean and Gordon Hay were a formidable pair. She was an artist and superlatively frugal; he was a proud and well-mannered schoolteacher with a temper that could be explosive. Elizabeth, their oldest daughter, was said to be a difficult and selfish child. Elizabeth always suspected she would end up caring for her parents in their final years, a way of making up for the sins of her childhood, proving herself to be a good daughter after all. But as her parents, who had been ferociously independent people, became increasingly dependent on her, their lives changed utterly and so did hers. Philip Roth once said, "Old age is a massacre." All Things Consoled takes you inside the massacre. In this startlingly beautiful memoir, with brutal candor and irresistible wit, Elizabeth Hay offers insight into the exquisite agony of a family's dynamics--sibling rivalries, miscommunications that spur decades of resentment all matched by true and genuine love and devotion--and reaches a deep understanding of the most unforgettable characters she will ever know, the vivid giants who were her parents. 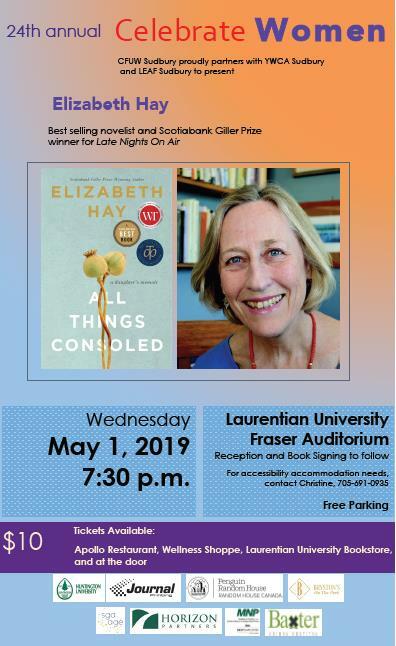 Elizabeth Hay is the author of the #1 nationally bestselling novel Alone in the Classroom, the Scotiabank Giller Prize-winning novel Late Nights On Air, as well as four other highly acclaimed works of fiction, His Whole Life, A Student of Weather, Garbo Laughs, and Small Change. All Things Consoled, her first book of non-fiction, is shortlisted for the RBC Taylor Prize and the winner of the 2018 Hilary Weston Writers’ Trust Prize for Nonfiction. Formerly a radio broadcaster, she spent a number of years in Mexico and New York City before returning to Canada. She lives in Ottawa.